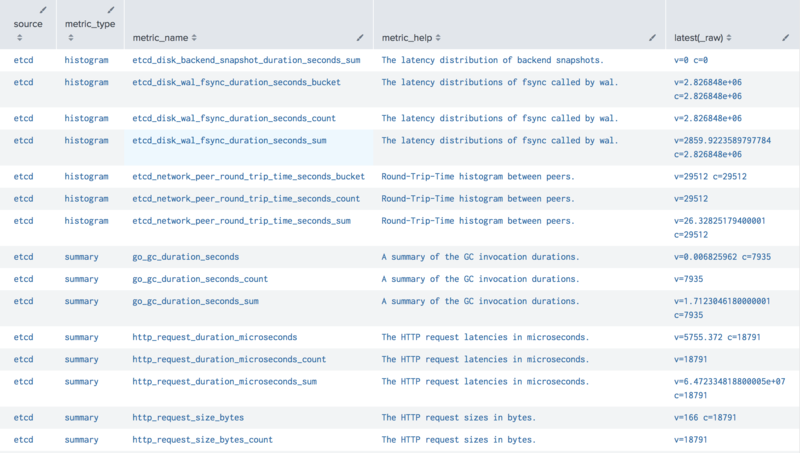 Most of the components in OpenShift control plane export metrics in Prometheus format. The collector can read these metrics forward them to Splunk Enterprise or Splunk Cloud. Our installation has default configurations for collecting metrics from API Server, Controllers, Kubelets and etcd cluster. In most OpenShift providers you don't need to do additional configuration to see these metrics. 004-addon.conf installed as a deployment and used only once in the whole cluster. Place your Prometheus configuration here, if you want to collect metrics from endpoints or service. Examples of these Prometheus configurations are controller manager and scheduler, which can be accessed only from an internal network and can be discovered with endpoints. Another example is etcd cluster running outside of the OpenShift cluster. On master nodes collectors reads and forwards metrics from the API server. We deploy this configuration using 003-daemonset-master.conf. On master nodes collectors reads and forwards metrics from the controller. We deploy this configuration using 003-daemonset-master.conf. Verify that these certificates are available, if not, make appropriate changes.